A much-branched polygamo-dioecious shrub or small tree up to 8 m., more rarely up to 15 m.
Young shoots and petioles minutely adpressed fulvous-pubescent at first, soon glabrescent. Buds perulate; perulae 2–3 mm. long, densely sericeous. Petioles 5–9 mm. long; leaf-blade oblong-lanceolate or oblong-oblanceolate, 8–15 cm. long, 2–6 cm. wide, obtusely acuminate, more or less symmetrically cuneate, very shallowly denticulate to subentire and undulate, thinly coriaceous, shiny above, lateral nerves 6–7 pairs, commonly looped within the margin, tertiary nerves reticulate, all nerves fairly prominent beneath, ± glabrous above, very sparingly pubescent at first, later glabrescent beneath. Stipules lanceolate, 5(–10) mm. long, 3–5-nerved, puberulous at first, deciduous. Flowers fasciculate, axillary, often in the axils of fallen leaves. Male flowers:pedicels 2 mm. long, pubescent; sepals 4–5, orbicular or suborbicular, 3 mm. long, 3 mm. wide, sparingly to evenly adpressed-pubescent without and within, ciliolate, cream-coloured; stamens 8–12, in a single peripheral whorl, 2 mm. long, anthers 0.7 mm. long; disc lobulate around the margin, the lobes partially enveloping the filaments, ± smooth, pubescent. Polygamous flowers:pedicels and sepals as in the ♂ and ♀ flowers; stamens and disc as in the ♂ flowers; ovary as in the ♀ flowers. Female flowers:pedicels and sepals ± as in the ♂; disc 4–5 lobed, glabrous; ovary 2-locular, subglobose, 2 mm. long, 2 mm. wide, densely fulvous-pubescent; styles 2, 1 mm. long, persistent; stigmas flattened, obtriangular-transversely ovate, 3 mm. across, ± smooth. Male flowers:pedicels 2 mm. long, pubescent; sepals 4–5, orbicular or suborbicular, 3 mm. long, 3 mm. wide, sparingly to evenly adpressed-pubescent without and within, ciliolate, cream-coloured; stamens 8–12, in a single peripheral whorl, 2 mm. long, anthers 0.7 mm. long; disc lobulate around the margin, the lobes partially enveloping the filaments, ± smooth, pubescent. Female flowers:pedicels and sepals ± as in the ♂; disc 4–5 lobed, glabrous; ovary 2-locular, subglobose, 2 mm. long, 2 mm. wide, densely fulvous-pubescent; styles 2, 1 mm. long, persistent; stigmas flattened, obtriangular-transversely ovate, 3 mm. across, ± smooth. Polygamous flowers:pedicels and sepals as in the ♂ and ♀ flowers; stamens and disc as in the ♂ flowers; ovary as in the ♀ flowers. Fruit ellipsoid-ovoid, 1.5 cm. long, 1 cm. wide, smooth, sparingly pubescent. Understorey of rain-forest, particularly in rocky gorges; 1220–1520 m.
W.J. Eggeling, Indigenous Trees of the Uganda Protectorate, ed. 2: 124 (1952), in adnot. Pax & K. Hoffm. in A. Engler, Das Pflanzenreich IV. 147(15): 259 (1922). A. Engler & O. Drude, Die Vegetation Der Erde, IX, Pflanzenwelt Afrikas 3(2): 34 (1921). Hutch. 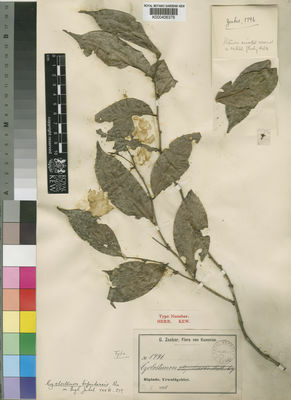 in Flora of Tropical Africa 6(1): 679 (1912).